Twelve years ago I visited London’s Tate Gallery and it was one of the most memorable museum experiences of my life. I fell in love with Rothko, Giacometti and Matisse who each influenced my fascination with modern art. The bustling energy of the Tate Gallery’s contemporary wing was palpable, and their iconic collection was exquisitely curated. Over the years the Tate’s contemporary collection outgrew their surroundings and the museum moved into a new space Bankside, south of the Thames. Here the collection has a distinct identity and is a major draw to the revitalized community. In January I returned to London, but sadly, twelve years later the euphoria felt in my first visit didn’t make the move into the new space. The setting is stunning, especially if you cross the Thames over the Millennium Bridge. 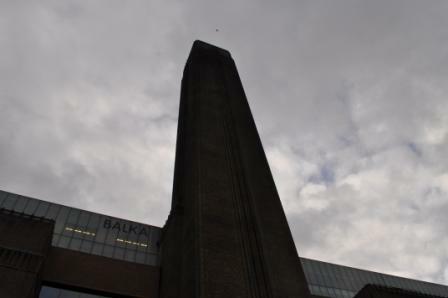 The Tate Modern occupies the old Bankside Power Station, abandoned since 1982. The enormity of the building is quite imposing, and the cold architectural aesthetic was accentuated by the cold, dreary, rainy January weather. Entrance to the museum is free however there is a small charge for use of a computerized audio guide. The 5 floors of gallery space showcase the usual suspects, with plenty of interesting multimedia and interactive exhibits for art lovers of all ages. I spent quite a bit of time reacquainting myself with one of Matisse’s most interesting abstract works, “The Snail’. The piece was orchestrated by the artist one year before his death. Matisse directed his assistants to watercolor large pieces of paper that he subsequently cut and arranged on canvas and pinned into place. If you look closely at the work in person you can still see the pinholes. 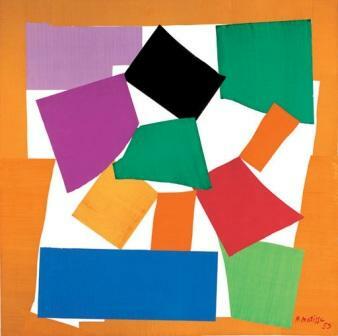 The saturated colors in the piece were so vibrant that Matisse had to wear sunglasses while working on it. “The Snail” is an incredibly simple, beguiling specimen, and every time I look at it I see something new. This time my husband showed me a jagged imperfection in the top left lavender panel. The apparent flaw takes on a subtle profile of a snail. Even though I reconnected with beloved works and found new artists, I was distracted by the space at Tate Modern. It is almost too large and imposing for the works housed here, and there was a lack of aesthetic appeal to the interior space beyond the galleries. Even simple restrooms looked like they came out of an elementary school. Museum gift shops will usually sell crafts from local artists; while the Tate Modern had two shops, the one I visited had a limited collection of books and collectibles. It was at this point during my visit that I started thinking about funding. The Tate reportedly gets 2M visitors a year. I think it is wonderful that the museum is free, but I think they could enhance the visitor experience by charging an entrance fee. They could reinvest profits into revamping the common space (a proper lobby, a sculpture garden and better merchandising in the gift shop). I would be more inclined to visit again if I knew that the museum improved all of the above, and I’d gladly pay a small fee for the improvements. Ensuring access to all is as easy as having free admittance one day out of the month. The good news is that the Tate Modern is developing a new wing opening in 2010 which will undoubtedly soften the edge of the Powerstation and provide much-needed space for public use. Architecture aside, I will continue to visit the Tate Modern to pay my respects to some inspirational works of contemporary art. Thanks for sharing this about the Tate- I visited London in 09 and didn’t get to go as it was closed – but I do visit the Tate site online often. I love Matisse and the above piece- The Snail. He was so playful and innovative in his work- made the process seem simple though it wasn’t. I guess that is the key to a GREAT artist. Hi Brenda, that’s so true! Matisse was so ill during that point in his life, it was interesting to see the vibrance in his works during this time.